South African Airways (SAA) is finally starting to make progress on a strategic plan that was initially prepared in early 2013. SAA has been highly unprofitable in recent years as it has struggled to secure the government approvals needed for a meaningful restructuring. The ailing flag carrier is cutting its Beijing and Mumbai routes at the end of Mar-2015 but launching Abu Dhabi as part of an expanded partnership with Etihad. Trimming the long-haul network and relying more on partnerships are crucial components of a new business plan that SAA until now has been stymied in implementing due to continued resistance and meddling from its government shareholder. But SAA still has a several challenges to overcome, including increasing competition from LCCs on domestic and regional international routes. SAA has been highly unprofitable since the fiscal year ending 31-Mar-2012 (FY2012), accumulating losses exceeding USD300 million. The group reported on 30-Jan-2015 an EBITDA loss of ZAR374 million (USD37 million) on ZAR30.3 billion (USD3.0 billion) in revenues for the fiscal year ending 31-Mar-2014 (FY2014). The results announcement, which had been delayed for several months, were limited to EBITDA figures and did not provide normal EBIT/operating or net profit/loss figures. While revenues were up 12% on a local currency basis they were down slightly on a USD basis due to the depreciation of the South African rand. The USD was up about 9% against the rand in FY2014 compared to the average exchange rate for FY2013. 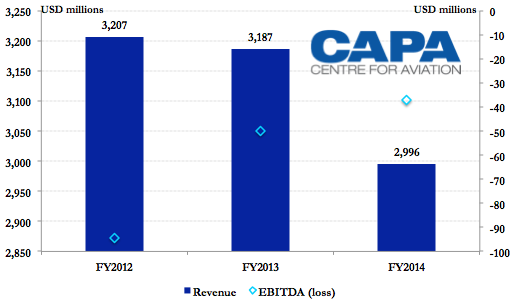 SAA had an unsustainable EBITDA margin of negative 12% in FY2014 and negative 16% in FY2013 (based on local currency). Both years the losses were entirely driven by a very weak performance on long-haul or intercontinental routes. SAA posted profits on an EBITDA level for its domestic and regional international operation (intra-Africa) for both years. SAA’s long-haul operation incurred an EBITDA loss of ZAR1.6 billion (USD158 million) in FY2014 compared to a loss of about ZAR1.3 billion (USD140 million) in FY2013. 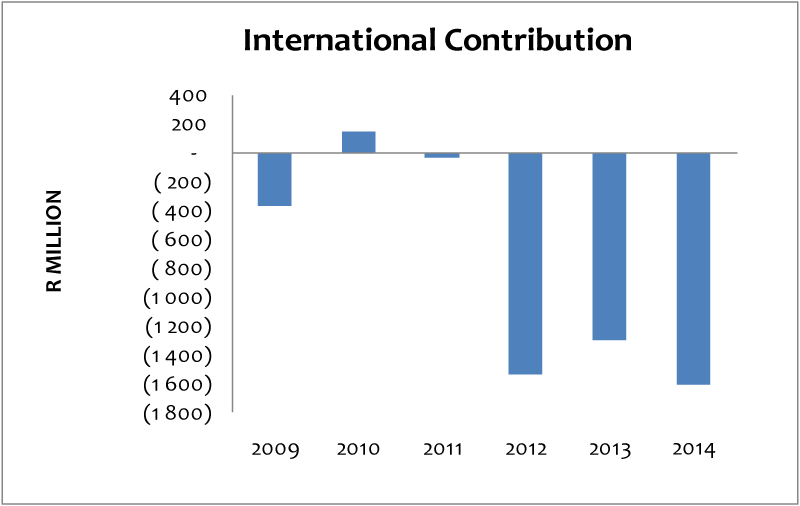 Note: International contribution only includes intercontinental routes; regional international routes are counted under a separate category. 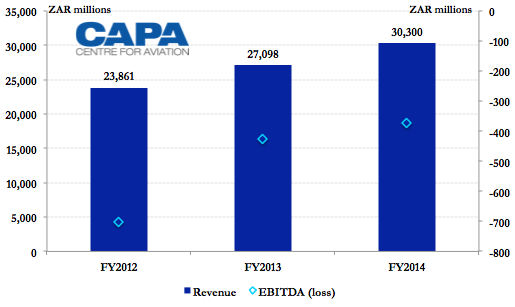 As CAPA previously highlighted, SAA carried fewer passengers in FY2014 than FY2008. With slightly over 7 million annual passengers, SAA is still the largest airline in Africa. But Ethiopian Airways, which has more than doubled its passenger traffic over the last five years and carried 6 million in its fiscal year ending Jun-2014, is poised to overtake SAA within the next year. Ethiopian already has the largest fleet among African airlines. SAA is expected to also report a large loss for FY2015, driven again by losses on all 10 of its long-haul routes. In announcing its FY2014 results and turnaround plan on 30-Jan-2015, SAA unveiled plans for suspending services to Beijing and Mumbai from the end of Mar-2015. Beijing, which was launched in 2012, and Mumbai are both currently served with three weekly flights. Mumbai and other new offline destinations in India will be served from Apr-2015 via Abu Dhabi as part of an expanded partnership with Etihad and Jet Airways, which is partially owned by Etihad. SAA also has expanded its partnership with Air China, which will take over the Johannesburg-Beijing route from May-2015. Government meddling and intervention have been a normal practice, creating instability and making it impossible for the airline to turn the corner. SAA also has been set back by frequent turnover at the chief executive and board level. The latest CEO, Monwabisi Kalawe, was suspended at the end of Oct-2014 after only 16 months at the helm. The well-regarded longstanding CEO of budget subsidiary Mango, Nico Bezuidenhout, has since been acting as interim CEO and is leading the current turnaround initiative. Mr Bezuidenhout was also interim CEO in early 2013 following the suspension of Vuyisile Kona. Mr Kona had replaced Siza Mzimela, who had been CEO for less than two years until she resigned in Oct-2012 along with most of SAA’s board. Mr Bezuidenhout was however overlooked when the "permanent" incumbent was appointed in Apr-2013. During his first stint as interim CEO Mr Bezuidenhout led the effort to draft the new strategic plan which Mr Kalawe agreed with but was unable to implement due to government resistance and infighting. SAA is now finally making progress with implementation, ironically with Mr Bezuidenhout back in charge. It would be sensible to appoint Mr Bezuidenhout as permanent CEO as it would provide SAA with improved stability and boost the prospects of the new business plan being implemented successfully. Improving the viability of at least two Asian routes through stopovers in the Middle East is among several initiatives aimed at improving the profitability of SAA’s long-haul network. All three of SAA’s Asian routes and all 10 of its long-haul routes are currently unprofitable with Beijing seeing the largest losses per flight. Etihad proved to be an eager suitor, leading to the forging of an expanded partnership with SAA in late 2014. Etihad and SAA began codesharing in 2013 but their relationship was initially limited to Etihad’s daily flight from Johannesburg to Abu Dhabi and seven destinations beyond Abu Dhabi as well as SAA-operated domestic connections beyond Johannesburg. Emirates and SAA have been partners for several years but also on a limited basis covering Emirates’ flights to Dubai from Cape Town, Durban and Johannesburg. SAA ultimately decided against operating beyond Abu Dhabi to Beijing and or Mumbai. SAA instead will rely on Etihad and Jet Airways-operated flights from Abu Dhabi to Mumbai as well as several other destinations throughout India. Such an arrangement is logical as SAA would incur significantly higher costs than Etihad or Jet if it elected to operate on the Abu Dhabi-Mumbai route. Meanwhile the idea of serving Beijing via Abu Dhabi became moot as SAA was also able to forge an expanded partnership with Air China in Dec-2014. Under the new partnership Air China plans to launch services to Johannesburg in May-2015 and codeshare with SAA beyond Johannesburg. Air China previously had a limited partnership with SAA covering only SAA’s Johannesburg-Beijing flights and Air China connecting flights from Beijing to Shanghai. SAA’s relationship with its government owner appears to be finally evolving into a more realistic scenario that will give SAA the flexibility to restructure with the expectation it can turn the corner and become financially viable. For years SAA has been stuck in a scenario in which it was unable to fully restructure because of government meddling but faced the unrealistic expectation of becoming viable. The government has been reluctant to provide SAA with the long term funding that would be required to maintain highly unprofitable but politically important routes such as Beijing. SAA is now operating as a going concern but has secured short term solvency and liquidity through government guarantees. The government has stated that it still does not intend to recapitalise SAA and funds required outside the guarantees could be sourced through the sale of non-core assets. SAA’s prospects for returning to the black in the fiscal year starting 1-Apr-2015 (FY2015) clearly improve given that the Beijing and Mumbai routes will be terminated by the end of the current fiscal year. SAA should also benefit from the sharp decline in fuel prices as well as the expanded partnership with Etihad and Air China. But SAA still faces several challenges and has several obstacles to overcome if it is to succeed at turning around. SAA’s eight remaining intercontinental routes are still unprofitable – Frankfurt, Hong Kong, London Heathrow, Munich, New York, Perth, Sao Paulo and Washington Dulles. 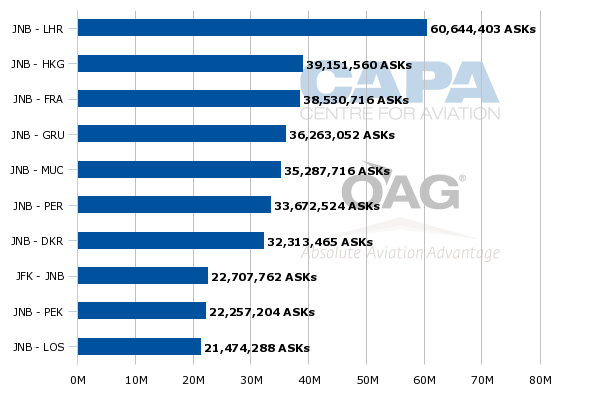 Of its current 10 long-haul routes, eight are among its top 10 based routes based on weekly ASKs. The other two are Johannesburg-Dakar, which is the first leg of its Johannesburg-Dakar-Washington service, and Johannesburg-Lagos. SAA has even struggled to compete in London, which has always been its biggest long-haul market and is currently served with two daily flights (down from four flights previously). CAPA reported in Jun-2015 that SAA has been incurring losses on the Johannesburg-London Heathrow route of about ZAR300 million (USD27 million) to ZAR350 million (USD31 million) per year. SAA’s initial turnaround plan identified widebody fleet renewal and product upgrades, including the introduction of a premium economy cabin, as essential measures for achieving profitability on London and other retained long-haul routes. SAA has been eager for several years to acquire new widebody aircraft to replace its fleet of A340s. Several requests for proposals have been issued, including tenders in 2012 and 2014, but SAA management has repeatedly been unable to secure the required approvals to place an order. SAA currently operates 17 A340s and six A330-200s, according to the CAPA Fleet Database. The group had been looking in 2015 at acquiring about 25 new generation widebody aircraft. While the most pressing requirement has been A340 replacements SAA has always viewed its A330s, most of which were added in 2011, as an interim aircraft. SAA currently uses the A330 to medium-haul destinations within Africa, Mumbai, Washington Dulles (served via Dakar) as well as some frequencies to London and Sao Paulo. A340s are used on most long-haul flights and some regional routes within Africa. SAA has stated the recent drop in fuel prices has reduced the urgency of replacing the A340s. But SAA will still clearly need to renew its widebody fleet – the sooner the better – as it cannot rely on oil prices remaining low for the long term; although the breathing space will be welcome. SAA also still needs to upgrade its in-flight product. This can potentially be achieved through retrofits but investing in A340 upgrades is a higher risk option. SAA also faces potential challenges in the domestic and regional international market which could result in domestic losses. SAA faces increasing LCC competition in the domestic market following the Oct-2014 launch of FlySafair. Another LCC start-up, Skywise, is planning to launch services in Mar-2015. SAA and Comair, which operates a full-service British Airways franchise and LCC Kulula, have enjoyed a duopoly in the South African domestic market since 2012. The market suffered from overcapacity and aggressive competition, leading to losses, before two other LCC competitors collapsed in 2012. SAA may need to implement further domestic capacity reductions. SAA has already pulled out of most non-trunk routes, which are now mainly served by budget subsidiary Mango or its two regional airline partners. Mango has been consistently profitable but is still relatively small, operating a fleet of eight 737-800s to seven domestic and only one international destination. The regional international market has been highly profitable for SAA the last several years, helping to partially offset the stiff losses on long-haul routes. SAA has continued to expand its network in Africa as well as add capacity on existing routes. But the group has not yet succeeded at its goal of expanding and diversifying its intra-Africa operation through acquisitions or joint ventures in other parts of Africa. SAA is planning to pursue further regional capacity expansion in 2015 by adding frequencies on several routes. But SAA will need to relook at its strategy for Africa in light of the intensifying competition from LCC start-ups, particularly flyafrica.com. SAA will face LCC competition on seven regional international routes by the end of Mar-2015 compared to only one in Mar-2014 and zero in Mar-2013. flyafrica.com has been able to quickly build up a presence in South Africa’s short-haul international market by establishing affiliates in neighbouring countries and pursuing fifth freedom rights where available. This is a logical strategy as South African carriers are generally fully using their traffic rights to other countries in Southern Africa while there are still available rights for carriers on the other side. flyafrica.com plans to operate 46 weekly flights to South Africa by the end of Mar-2015, giving it about 10,500 weekly seats. This equates to a 9% share of total capacity between South Africa and other countries in Southern Africa – a significant figure given that flyafrica.com only launched in Jul-2014 and does not have a South African franchise. It is also significant as flyafrica.com is the only LCC operating services between South Africa and any of the other 14 countries in Southern Africa. SAA will ultimately need to relook at its two-brand strategy and start using Mango on international routes within Southern Africa. SAA cannot assume it will be able to continue to enjoy extremely high profit margins on regional routes within Africa, which have some of the highest average fares in the world. As SAA will face a new set of challenges over the next several years it needs to make sure the current restructuring succeeds. SAA cannot afford any further delays or setbacks. SAA has in place a sensible turnaround plan and an adept management team that is keen to finally address some of the carrier’s longstanding problems. But this is just the beginning of a new chapter for the beleaguered flag carrier. SAA has a long road ahead and will need unwavering support from its government shareholder as well as complete flexibility to respond to the new competitive pressures it will face. For the moment this requirement seems to be being met; but history suggests sustained common sense from government should not be relied on.